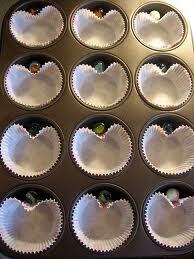 Sisters with Stuff: Probably have seen this but it's still a genius idea! Probably have seen this but it's still a genius idea! I'm sure you have seen this picture floating around on blogs or Pinterest but I had to share because I think it's just absolutely genius, how to make heart shaped cupcakes. I can't take credit for the photo or idea, I tried to track down who the photo belongs to originally but it has been shared and reshared so many times that I don't know where it came from. In the photo they are using marbles but I have also heard that using little balls of foil works better, either way I Love It! 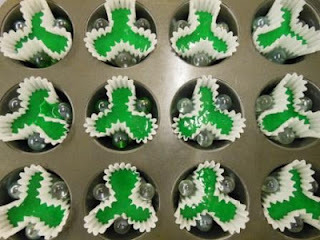 I found this one on Pinterest, thanks to www.easy-cake-decorating.com for the picture, easy way to make shamrock shaped cupcakes, love this idea too!